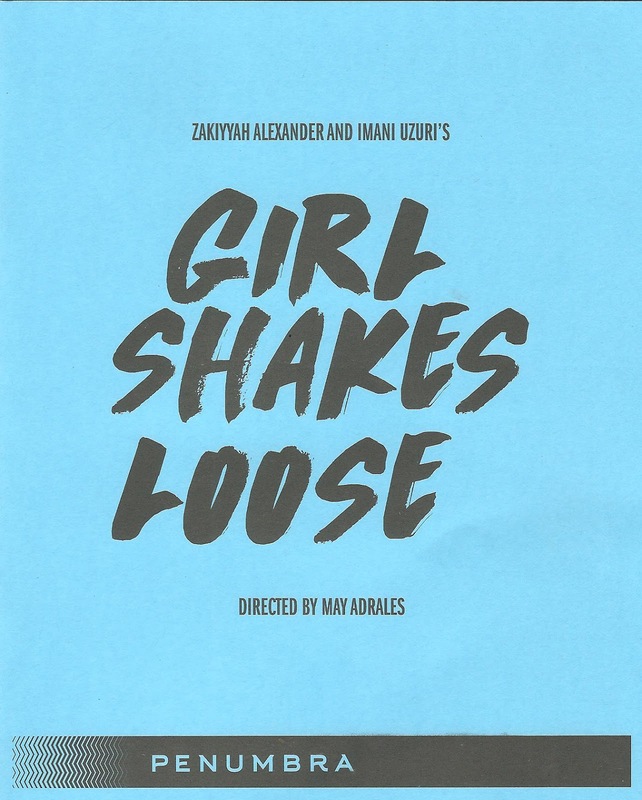 Girl Shakes Loose is the musical we need right now. It's playing at Penumbra Theatre in St. Paul through May 14 and you should definitely go see it, but I'm hoping it has continued life after this run. I don't know what the creators/producers have planned, but I would love to see it on Broadway. I think we need to see it on Broadway. 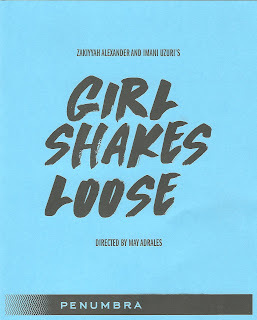 Written by a black female composer/playwright team (Imani Uzuri music and lyrics, Zakiyyah Alexander book and lyrics) and incorporating the poetry of Sonia Sanchez, a poet in the Black Arts Movement,* Girl Shakes Loose is something we've never seen before. Namely, a musical about a contemporary black woman with an all black cast. 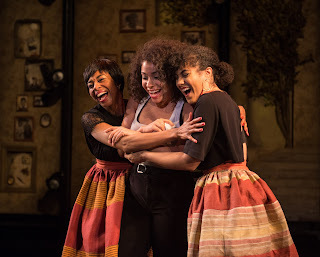 Musicals with a black female lead** are few and far between (the only ones I can think of are Lady Day at Emerson's Bar and Grill, The Color Purple, Caroline or Change, Aida, Porgy and Bess) and are all set in the past. Most musicals that feature an all black cast are about overcoming hardships - racism, abuse, poverty. Which are important stories to tell but definitely do not represent the entirety of the African American experience. Girl Shakes Loose is a different narrative. It's about a young black woman living her life and figuring out who she is and where she fits in the world. It shouldn't be revolutionary in 2017 to see a musical created by black women about a contemporary black woman in America, but it is. I'm thrilled to have witnessed it and excited to watch it go out into the world from here. So now that we've gotten the revolutionary historical significance of Girl Shakes Loose out of the way, let's talk about the show itself. Which, I'm happy to report, is fantastic. 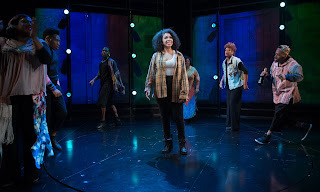 The score feels contemporary and fresh, the staging and choreography are clever and interesting (directed by May Adrales with choreography by Karen L. Charles), and the story of the titular "girl" is compelling. While it may not be the most original story - a young woman is devastated by a career set-back, painful break-up, and a death in the family, and has a (very) early mid-life crisis about who she is, what she wants to do with her life, even where she wants to live - what is original is a musical that "allows for the full expansiveness of modern, black female identity" (Artistic Director Sarah Bellamy). The story and our protagonist travel from New York City to Georgia to San Francisco, with the ensemble playing multiple roles in addition to being a supporting chorus in many scenes/songs. This mostly local cast is bursting with talent and such a joy to watch. 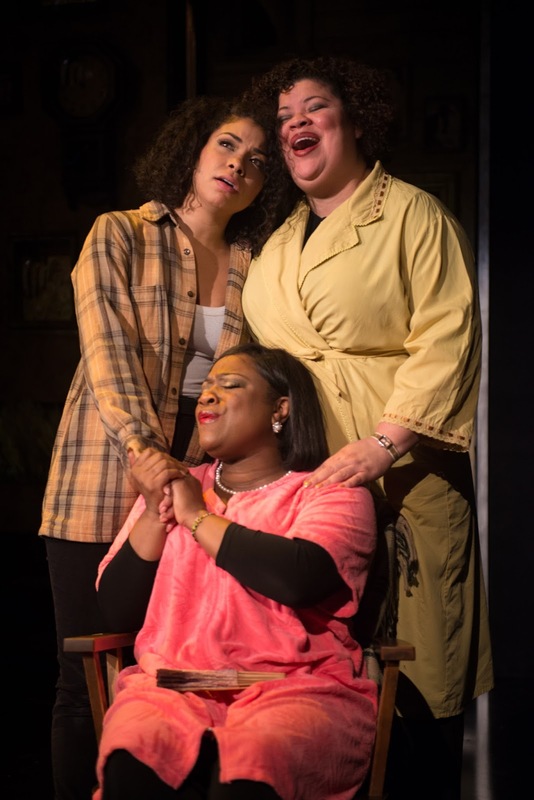 Alexis Sims (new to the Twin Cities) is a star in the role of the girl (stunning voice, and so empathetic and natural), but this is also a great ensemble piece; everyone gets their moment to shine. Jamecia Bennett brings her usual fierce attitude (of which I only wish I possessed a fraction); China Brickey is a comic highlight at the hipster roommate; John Jamison is a scene-stealer in multiple roles and a Triple Threat with a capital T; Lamar Jefferson brings the house down as a preacher; the always wonderful Thomasina Petrus is the tough but loving mother (the three-part harmony between Thomasina, Jamecia, and Alexis is a musical highlight); Valencia Proctor doesn't have any named roles but is a vital part of the chorus; Kory Pullam is charming as the girl's long ago ex; and Tatiana Williams is terrific as the girl's recent ex (did I mention this musical also features a bisexual lead? also revolutionary!). And everyone in this cast can sing beautifully and powerfully, making the score sound great, backed by the awesome four-piece band led by Sanford Moore. It's official - I'm obsessed with Trevor Bowen's costume design. From the playful and eclectic patchwork design of Ten Thousand Things' Pericles to the dreamy ghost culottes of The Paper Dreams of Harry Chin, and now this. He's dressed the chorus in black jumpsuits, all different and all fabulous. They serve as a backdrop for other costume pieces when a chorus member steps into the story to play a character, simple or showy, colorful or elegant, all instantly character defining. Vicki Smith's scenic design is also cool and effective, serving the three different location. Rotating panels represent first the steely modern NYC, then a homey Georgia abode, finally the cool San Francisco vibe, with a few simple set pieces to match. Projections (designed by Kathy Maxwell) further define setting and tone. Girl Shakes Loose is a catchier title than the more descriptive Girls Grows Up and Becomes a Woman. But that's really what it's about; a young woman figuring out how to be herself and live the life she wants, something we've all experienced or are currently experienced. It's as simple as that, and profound in the voices and stories being heard in musical theater of the kind that we haven't heard much before. Namely, black women telling the story of a black woman in contemporary America, all wrapped up in an entertaining, fun, moving, relevant, modern musical. Hooray! Go see this ground-breaking new musical at Penumbra before it, like the girl, flies off to other places to accomplish even greater things. *Penumbra Theatre was also an important part of the Black Arts Movement. Go see the wonderful exhibit "Penumbra Theatre: Art, Race, and a Nation on Stage" at the Minnesota History Center for more on that. **If I've missed any musicals with a black female lead, please comment below. You're welcome Imani and thank you for reading it! I'm mortified to discover that I neglected to credit you and your co-creator so I've corrected that oversight, I apologize. Best of luck to you, I look forward to see where Girl goes next! Perhaps"Pippin" qualifies. Patina Miller. Going this afternoon. All I can say that you've captured the relevance, excitement, strength and power of this play. I just seen the play last night and was truly captivated and glued to my set wanting more by this cast. This is truly a must see! Good thought, Rick, but I'm thinking specifically of lead roles that were written as black female characters. There have been a few instances of black women playing roles originated by white women (Audra McDonald in 110 in the Shade) or black men (Patina Miller in Pippen). That kind of unconventional casting is also great and important, but so is writing characters that are specifically people of color to represent that experience on stage.